Nov. 2, 2003: Variety show host Art Linkletter arrives at the "CBS At 75" celebration at the Hammerstein Ballroom in New York City. 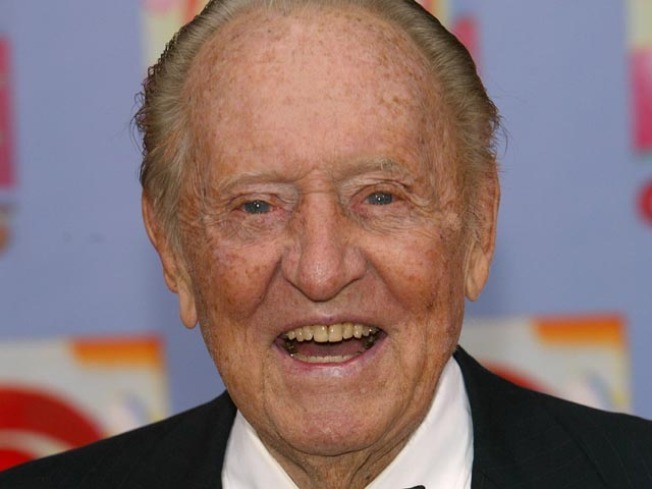 Art Linkletter, who hosted the popular TV shows "People Are Funny" and "House Party" in the 1950s and 1960s, has died. He was 97. His son-in-law Art Hershey says Linkletter died Wednesday at his home in the Bel-Air section of Los Angeles. Linkletter collected sayings from the children into "Kids Say The Darndest Things," and it sold in the millions. The book "70 Years of Best Sellers 1895-1965" ranked "Kids Say the Darndest Things" as the 15th top seller among nonfiction books in that period. The primetime "People Are Funny," which began on radio in 1942 and ran on TV from 1954 to 1961, emphasized slapstick humor and audience participation _ things like throwing a pie in the face of a contestant who couldn't tell his Social Security number in five seconds, or asking him to go out and cash a check written on the side of a watermelon. But in 1969, his 20-year-old daughter, Diane, jumped to her death from her sixth-floor Hollywood apartment. He blamed her death on LSD use, but toxicology tests found no LSD in her body after she died. Still, the tragedy prompted him to become a crusader against drugs. A son, Robert, died in a car accident in 1980. Another son, Jack Linkletter, was 70 when he died of lymphoma in 2007. Linkletter was born Arthur Gordon Kelly on July 17, 1912, in Moose Jaw, Saskatchewan. His unwed mother put him up for adoption when he was a baby; when he was about 7, he and his adoptive parents moved to the United States, eventually settling in San Diego. "But I'm an optimist. Even though I've had tragedies in my life, and I've seen a lot of difficult things, I still am an optimist." Linkletter is survived by his wife, Lois, whom he married in 1935, and daughters Dawn and Sharon.